Vaanika turned the page of her newly bought notebook, having just finished writing the first page. Holding the pen in her left hand, she got her free hand to tuck the careless strand of hair behind her ear. She got her pen to make a dot on the fresh white page and her mind went blank. She was going through the best days of a woman’s life. She was going to become a mother. She had so many plans for the life she was about to create and upon all of it, she was going to write something. She was going to write that book people always wish they will write but end up telling people, “Maybe someday”. But Vaanika had finally decided. It was early in her pregnancy and she wanted to complete it by the time she has had her child and has to again go for work. She had some ideas and she wanted to build upon them slowly, beginning now. So she took out time between her office hours and small chores at home to think and to write. But she couldn’t. She realized that it was one thing to muster up a story in her mind and an altogether different one to pen it down. This was the reason why she had not gone for the usual word-editor on her laptop because she thought then she would only be staring on that blinking cursor for hours. 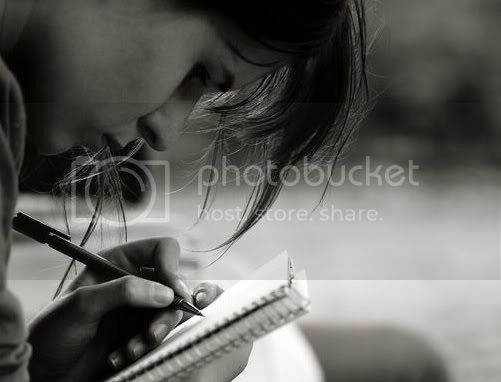 Carrying a pen and her notebook at all times gave her a nice, warm feeling of being a writer. Still, a page in and she was lost. Still thinking, her pen had come to her lips when Raghav came into the room. He saw her dilemma straightaway and being the caring husband he was, knew exactly what his wife needed, “Stuck in your book? You Mam, need a break”. Vaanika looked up at him, just back from his work and still fresh as a daisy. “Let’s go to the park, OUR PARK”, he said. Vaanika smiled and nodded. She chuckled in herself at the thought of how fortunate she was to be living the dream she once saw with Raghav. She carefully put the pen in her notebook and put it into that jute bag Raghav had gifted her last week. She changed to something peppy and cool and they got out. In ‘their’ park, Vaanika went through all those warm and wonderful memories she always cherished as she walked hand in hand with Raghav. She saw the elderly couple on that bench, talking about the life they had spent together. She looked at the birds returning to their nests and she looked at the little children playing on the swings. She realized that soon in time, they would come not two but three to the park and their lives would be even better. Returning home with a joyous mood, she went back to writing as Raghav made a warm, sweet cup of tea for the both of them. She began with her pages, sipping in between, as Raghav went back to his work. But soon after a few pages, she was lost again. She then heard a knock on the door and Raghav got up to answer it. It was the maid. Vaanika told her about the dinner and came back to her bed. Sitting beside Raghav, she pondered over the different paths her story could take from there but she rejected them all. Soon it was time for dinner as she closed her book to be opened another day. The next morning, it was Sunday and she was determined to write something good. Having gotten fresh, Vaanika sat to write again and she was writing good. Then, there was a knock on the door and she got up to open it. Suddenly, she felt immense pain near her abdomen and fell to her knees. She cried for Raghav and just when he came to her , he saw that she was bleeding. He lifted her up and got his neighbour friend to look at her. Soon as she came and saw Vaanika’s condition, she told him they needed to take her to the hospital. In the hospital, the doctors kept Vaanika for hours. Her pain had subsided but they were still ran some tests. Vaanika’s regular doctor knew her case well but she had not expected any complications. Soon the reports came and they were told that a miscarriage was inevitable. They were in tatters but the doctor said it could not be helped. “There would not be problems in future but for now, we have to do it”, they were told. For three days, they kept her there and Raghav was all the time beside her. Her family, friends all came to the aid but she knew nothing could be helped. On the fourth day, they brought her home. She was advised to rest and take pills regularly. Raghav’s mother stayed with them to take care of her. She told her how she understood her agony but that she needed to come to out of it. But she was inexorable. She felt broken, damaged and hurt. She had lost her baby and there could not be a bigger pain. Nothing healed her all this while, but time. She though about the various things her mind was tempting her to do but she learnt not to succumb to them. She used to look at Raghav and believe that she still had the world before her. Only now, she learnt to look differently at it. Weeks later, she was able to gather herself up and told everyone that she would be fine now. She told them she was trying to leave things behind but she could not move on just like that. They understood, he understood and hugged her close to her heart. He assured her the one thing he could tell her then, that everything was going to be okay and that one day, they would have a new beginning. Then one day, Raghav got her to revisit their park. Once again, she walked hand in hand with him, looked at the birds, looked at the elderly couples and at the children playing. And she did not shed a tear. At that moment, she knew she was fine as she hugged Raghav and told him “Thank you, Thank you for everything”. The next day, as she was going through some of the things she had left unattended all these days, she found her notebook. She found the pen alongside and she found her desire, her dream in that notebook. That night, Vaanika sat at her table and then she wrote. She held that pen in her hands, firm and resolute, and she bled words and lines. She poured her heart into the book and within weeks it was complete. When it got out, that book right there, was the best thing they had read in years.